Children in England are often caught up in vindictive legal action by divorcing parents, a survey suggests. 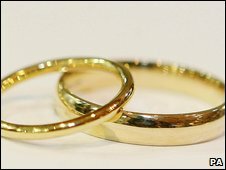 The research was carried out by law firm Mishcon de Reya among 2,000 divorcees and a similar number of children who had experienced divorce. Most parents said their child's welfare was their priority, but half admitted going to court over access and one in five wanted to damage their ex-partner. The government said the 20-year scope of the survey meant it was out of date. It added that families now had counselling and practical and legal support. The survey was carried out to mark the 20th anniversary of the Children Act, designed to improve the welfare of youngsters caught up in the middle of parental separation. It said that despite these good intentions the law was not working - with high costs in terms of litigation and social exclusion. The survey suggests that one in three children lose contact with their fathers after a divorce. Mishcon de Reya said a quarter of parents surveyed believed that their child was so traumatised by their separation that the children harmed themselves or contemplated suicide. "Despite this, 50% admitted putting their children through an intrusive court process over access issues and living arrangements," its report said. Nearly half (49%) admitted they had deliberately drawn out the legal process to secure their desired outcome. Two thirds (68%) admitted indiscriminately using their children as "bargaining tools" when they separated. "A staggering 20% of separated parents admitted that they had actively set out to make their partners experience 'as unpleasant as possible' regardless of the effect this had on their children's feelings." Half of the children surveyed said that their views were disregarded by both of their parents during the separation. Some 42% had witnessed aggressive rows between their parents, and 17% violent fights. In almost a quarter of cases one parent forced them to lie to another. As a result, more than one in 12 children (8%) had considered suicide as an escape and a third had turned to drug or alcohol abuse, according to the survey. One in 10 resorted to crime. The firm's head of family law, Sandra Davis, said: "This research shows that despite their best intentions, parents are often using their children as emotional footballs. "They don't have the tools to co-parent effectively following separation and their only solution is to turn to the courts. Children - alongside the economy - are suffering because of this." She called for national therapy centres to be set up. England's Children's Minister Delyth Morgan said: "Divorce and separation can have a devastating impact on children caught in the middle. But this survey, looking as far back as 20 years ago, simply doesn't reflect what support is available for families now. "No-one can accuse us of standing still on this - we've created the first ever government department specifically to deal with families and children's issues. "Mediation and support can be far better for children than going through the court system because it tackles the root cause of disputes - that's why we've acted to give families comprehensive counselling, practical and legal support." A consultation document on families and relationships is expected before the end of the year.